"[At] Oxy I'm going for the 'A' standard. If I can get the 'A' standard ... I know I'm not in the same league as Galen, Lagat, Lomong right now, but I'm coming for them. You guys hear that? I'm coming for you." "But just one step at a time. If I can get the 'A' standard at Oxy, even the 'B', I still have a chance. You know, line up at USA's and anyone's got a shot. So as long as I get the standard I got that much more hope than I had before to get to the World Championships." - A very excited Chris Solinsky talking after his 13:23.62 5,000 at Payton Jordan about trying to get the 'A' standard at the Oxy High Performance Meet on May 17th and his chances at making the US team for Moscow 2013. Ben True 13:14.44 - Unstoppable right now? What was your favorite race of all time? 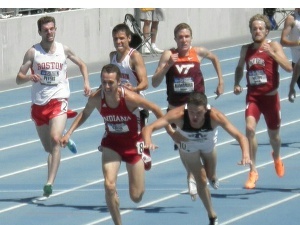 Should Webb do the 10K at Nats? New Japanese JR record for 100m... 10.01 seconds! Diego Estrada And Betsy Saina Are USTFCCCA DI Athletes Of The Week For Their Payton Jordan Performances Estrada ran 13:15.33 which is the second fastest by a collegian outdoors only behind Henry Rono's 13:08.4 from 1978. Saina ran 31:37.22 winning by 7 seconds with the No. 3 all-time collegiate mark. NAU Head Coach Eric Heins On Estrada's 13:15: “I think Diego took a big step forward tonight in establishing himself as a world-class runner." Cheever Talks About Her Huge PR: “I was hoping to get in the 9:40s so this was a really big surprise to run under 9:30 and have a 22 second PR." Britain's Olympic Triathlon Champion Alistair Brownlee Is Trying To Qualify For Selection To The UK Team For 2014 Commonwealth Games He ran 28:32.48 which puts him 22 seconds outside England Athletics' B qualifying standard. Drake: AJ Acosta Still Sponsor-less And Having A Rough Start To 2013 With A 4:11 (Kansas), 4:06 (Drake Road), And 4:05 (Drake Track) In His First Three Races He'll race again this weekend at the ReRun San Diego meet with a loaded mile field that includes David Torrence, Ryan Gregson, Donn Cabral, Cam Levins, Zan Robertson and Jordan McNamara. Drake Relays Deal With ESPN2 Hurt Local Stations Who Were Restricted On What Replays They Could Broadcast From The Meet The article leads with, "Why would the powerbrokers of a fringe sport set parameters on free publicity?" Europeans Fair Well At Drake Relays As Spanish HJer Ruth Beitia And Czech Republic's Zuzana Hejnova (400H) Both Win With World Leads German PVer Bjorn Otto beat his rival and Olympic champ Renaud Lavillenie twice, in both the mall and track competitions. Auction Of London 2012 Olympic Memorabilia Garners $77,000 A pink javelin signed by heptathlete Jessica Ennis went for $1,020. Tulsa Throws Its Hat In The Ring As A Potential US Bidder For The 2024 Olympics However, there is "little chance" of the USOC choosing Tulsa, which ranks as only the 45th largest city in the US. Break In Procedure During Board Of Cycling Ireland Meeting Which Nominated Pat McQuaid For UCI Head Leads To Nomination Being Declared Void The decision to nominate him will now be left up to an "Extraordinary General Meeting." Italian Olympians Daniele Meucci and Valeria Straneo Clear Winners At Chia Laguna Half-Marathon Meucci, who was recently second at the NYC Half, won in 1:07:45 and Straneo in 1:13:50 on what was apparently a very hilly course. World Marathon Championships Course Is Tested With Staging Of Russian Marathon Championships Last Saturday Artyom Aplachkin won the men’s title in 2:15:23, with Marina Kovalyova the women’s victor in 2:35:03. 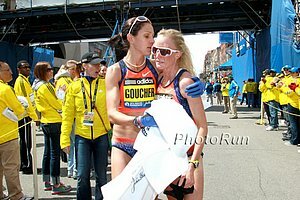 *Russian Recap Russia's 2:18 marathoner Liliya Shobukhova is skipping this season due to pregnancy. Friday: David Rudisha Says He's Recovered From His Cold And Will Open His Season At AK/National Bank Of Kenya Meeting In Nairobi wHe'll be in the 400 as will Pamela Jelimo. Others highlights include steepler Paul Kipsiele Koech in the 5000 against Richard Mateelong, Isaiah Koech Kiplagat in the 1500 and Olympic bronze medalist Timothy Kitum in the 800. June 1st: Olympic Champ Mariya Savinova Vs Former Olympic Champ Pamela Jelimo At This Year's Pre Classic 800 Also in the field are Alysia Montano and Janeth Jepkosgei. *Two Great Quotes From Emily Lipari And Cas Loxsom That Show The Passion Of Penn Lipari: "It's all about guts, and it's all about heart." Loxsom: "I heard all of those 'Nova fans with about 300 to go and said screw them." 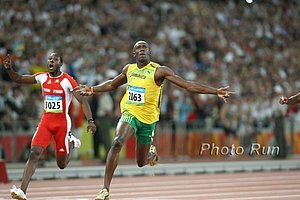 *Jeff Demps Gets Traded He ran the 4 x 100 at Penn. Felix: "I Love The Penn Relays"
Profile On NAIA Thrower Willy Irwin Who's 63 feet, 11 1/2 Inches In The Shot Put Would Put Him 2nd In D1 He passed up a scholarship offer from Oklahoma for the chance to be coached by 1976 Olympic champ Mac Wilkins. Kenyan Javelin Thrower Julius Yego Gets Telecom Sponsor eIn his early days, Yego taught himself how to throw by watching YouTube videos. Vermont City Marathon Offering Free Entry To Boston Marathon Participants Who Weren't Able To Finish More than 5,000 were stopped from finishing after the attacks. Pittsburgh Officials Reject Rock 'n' Roll Half Marathon Permit Application Because Of Heat Concerns For The Proposed August 4th Race About 4,000 runners had already registered. NCAA: Arizona State Men And Arizona Women Come Out On Top In Double-Dual Meet With Arizona, Arizona State And Northern Arizona Lawi Lalang made his season debut with wins in the 1,500 (3:41.52) and 5k (13:40.55). Brigetta Barrett won the HJ, tying her world-leading 6-4.25 (1.94m). 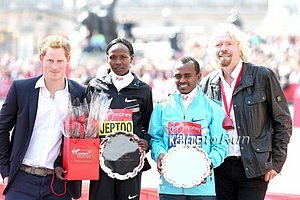 Ethiopians Dereje Debele And Melkam Gizaw Get Comfortable Wins At The Düsseldorf Marathon Debele won in a CR 2:07:48 while Gizaw (training partner of Olympic champ Tiki Gelana) won in 2:26:24. 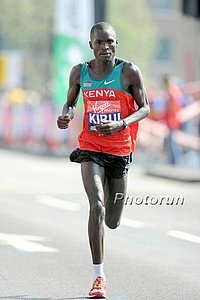 Kenya's Francis Kiprop Wins Rock 'N' Roll Madrid Marathon In 2:10:37 Over Nixon Kurgat (2:10:54) In the women's race, Spain's Vanessa Veiga beat out Ethiopia's Desta Girma 2:36:38 to 2:36:44. Recap Of Day 2 Of Sixth National Bank Of Kenya/Athletics Kenya Track & Field Meet: Robert Biwott Wins 1,500 (3:46.5) As Asbel Kiprop Skips The Finals David Rudisha was supposed to open his season with a 400 here, but came down with the flu. World Junior 1,500m champion Faith Chepng'etich won the 800 in 2:02.8. May 10th: 10 Olympic Champions And 14 World Champions On Start List For Doha Diamond League Meet Athletes competing include David Rudisha, Asbel Kiprop (1,500), Genzebe Dibaba (1,500), Allyson Felix vs. 2011 World champ Amantle Montsho and 2008 Olympic champ Christine Ohuruogu in the 400, Shelly-Ann Fraser-Pryce (200m), and Jesse Williams. 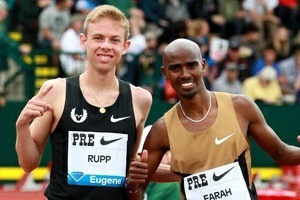 Galen Rupp Talks About Winning His Silver Medal And How He's More Motivated Than Ever To Win "I remember sitting back with Alberto when I was in high school, just 14 or 15 years old. He told me that 2012 and 2016 were probably going to be the two Olympics when I would be physically capable of getting a medal. It was such a long-term goal when we talked about it, even back then ..."